These Briefing Papers are available as a free download but they are not free to produce so if you would like to contribute to the work of JRI when you download please go to the Giving to JRI page on this site. Suggested donations are £1 for a .pdf and £2 for an e-book. This paper by Revd. Jonathan Clatworthy considers whether Christian concerns for the environment differ from secular ones. It looks at the ethical role of religion, and the particular emphases of Christianity through history evaluating where these have been helpful and where it may be considered that harm has occurred. The similarities and differences with secular environmentalism are explored. The paper includes a bibliography for further reading on the matters covered by the paper. It was published in April 2019 and is available as an 8 page pdf for online reading or download by clicking the title above. The image used here is ‘Creation – Day 1’ from Art in the Christian Tradition, a project of the Vanderbilt Divinity Library, Nashville, TN. 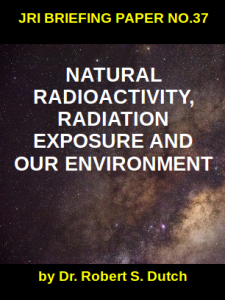 This briefing paper looks at natural radioactivity, radiation exposure and the environment, with a focus on ionising radiation which may have biological effects on cells. 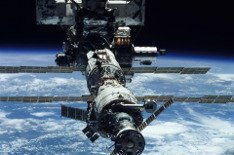 The paper considers our nuclear-powered and radioactive universe, identifies the four main sources of natural radioactivity and radiation exposures on Earth, as well as supplementary sources, and reflects on these findings from a Christian perspective. The paper was written by Dr. Robert S. Dutch, a former tutor at the nuclear training centre and course administrator and tutor in New Testament Greek at Bristol Baptist College, and a member of Christians in Science and author of the book “Let There Be Light!” Nuclear Energy: A Christian Case (Eugene, Oregon: Wipf and Stock, 2017). The Briefing Paper was published in August 2018. It is available as a pdf file (16 pages, view and download from the heading above or from this link) and in epub and mobi (Kindle) ebook formats. 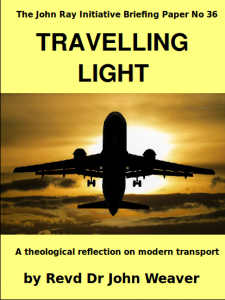 This briefing paper was published in June 2018 and follows on from the JRI conference held in March 2018 on the theme of ‘Transport Now and in the Future: What are the issues?’ This resource paper considers the experience of travel, analyses the impacts on, and resulting from, travel, integrates this with a Biblical reflection on the issues raised, provides suggestions for how we may respond to the situation and concludes with a brief summary of a possible way forward. This Briefing Paper, written by JRI Chairman Revd Dr John Weaver, is available to download as a PDF (8 pages) from this link and from the title above. It is also available in ebook formats from these links: epub – for Android and other ebook readers, and mobi for Kindle and Kindle reader software. 35. 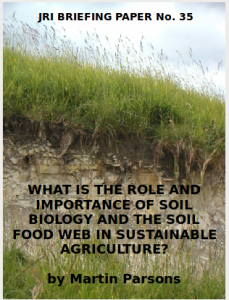 What is the Role and Importance of Soil Biology and the Soil Food Web in Sustainable Agriculture? Briefing Paper number 35 focuses on the impact of modern farming methods on soil biology, and in particular the soil food web, and considers whether this can be sustainable for the future. It sets these methods alongside Biblical instruction on how to care for the land, and presents some of the evidence for the biological and chemical changes made to the soil by modern agricultural practice. The importance of the Soil Food Web for the future is explored. This Briefing Paper was written by Martin Parsons, BSc CEng MIMechE CEnv FIAgrE and recent CRES graduate. It was published in March 2018. It is available to download from these links as a pdf file (8 pages, also accessed from the title above) and in Kindle and Epub ebook formats. 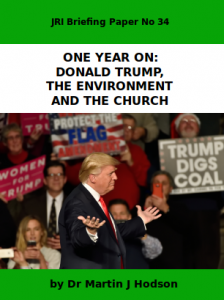 Briefing Paper number 34, ‘”One Year On: Donald Trump, the Environment and the Church” was published on 20th January 2018, one year after the inauguration of Donald Trump as President of the United States of America. The election of Donald Trump had raised a number of questions regarding the potential impact of this presidency on Environmental issues and the role and relationship of the Church in this context. In Briefing Paper 32 (see below) Dr Martin Hodson presented 12 questions to assist in the monitoring of these, and this briefing paper revisits these questions in the experience of the first 12 months of the presidency. The Briefing Paper is available as a pdf document (12 pages, with live links to the references) and in ebook formats epub for Android/ iphone etc and mobi for Kindle and Kindle readers. 33. What makes a successful environmental campaign? Briefing Paper number 33, “What makes a successful environmental campaign?” looks at examples of both successful and unsuccessful campaigns from the last three decades to identify the similarities where aims have been achieved and the common themes in failures. Written by CRES graduate Rob Hitchcock, he uses his employment background in management processes to bring best practice from industry alongside these appraisals and to consider where improvements can be made. Throughout the paper short Biblical reflections provide the vital extra dimension of spiritual wisdom to question worldly methods and to provide additional insight and guidelines. This Briefing Paper is available via these links in .pdf format for screen reading or printing (12 pages) and as epub and mobi (Kindle) ebooks. Published on the day of the inauguration of Donald Trump as the 45th President of the United States of America, the aim of this briefing paper is to give a reasonably complete assessment of the likely effects of Trump’s administration on the environment and then, more briefly, to look at the church response to date (20th January 2017). The Briefing Paper is available as a PDF format download file (20 pages) via the title link above and in ebook formats epub (for Android and e-reader software) and mobi (for Kindle and Kindle Reader software). 31. European Environmental Policy: Post Brexit what should we do? The European Union was the first major economy to table its commitment in the run up to the Paris Climate Conference (COP21), and continues on its path of transition to a low-carbon economy and society. The past record of Theresa May, the UK Prime Minister, shows that she has generally voted against measures to prevent climate change, although she has announced that the UK will ratify the Paris Agreement ‘by the end of the year’. With scientists pointing to a situation requiring increasingly urgent action, this paper explores current European Environmental Policy in its global context, and the impact that Brexit – with its current uncertainties – may have. The Christian call to engagement and action, as organisations and individuals, in response to the threats and fears, is presented as hope-filled discipleship ‘focused and centred in God’. Dr John Weaver is the Chair of the John Ray Initiative. (Briefing Paper PDF, 8 pages via the link above. For a printable version without live links click here) For E-book versions: click here for .mobi (Kindle) OR click here for .epub (other devices and apps) All links open in a new tab. on social-science research. Ordinands were asked to respond to the New Environmental Paradigm (NEP), and the importance of environmental issues and ecology in their faith. Data analysis revealed that churchmanship was the only variable that varied significantly. Evangelical ordinands gave some responses that suggest less interest in environmental concerns. Environmental theological education within the colleges surveyed needs to improve if the Church is to have a leadership role in reversing the human-induced causes of the environmental crisis. 24. Protecting the Soil Resource by Dr. David A. Robinson. “A nation that destroys its soil destroys itself.” F.D. Roosevelt in a 1937 letter to all state Governors in the USA, following the dust bowl, encapsulates the importance of soil protection. The dust bowl brought about US legislation to conserve soils as a fundamental natural resource. Supporting the provision of food, feed and fibre is only aspect of the functions that soils provide that are important for human wellbeing, and sustaining the functionality of the earth’s life support system. Download the PDF Protecting the Soil Resource. 23. Ecological Hope in Crisis? by Professor Richard Bauckham. The church has frequently had to think afresh about Christian hope in changing contexts. It’s not that the essence of Christian hope – the great hope, founded on Jesus Christ, for God’s redemptive and fulfilling renewal of all his creation – changes. But if Christian hope is to retain its power to be the engine of the church’s engagement with the world, if it is to be more than an ineffective private dream, hope itself needs renewal as the world changes. From the infinite riches of God’s future for the world we must draw those that can be transformative for our time. That way we can re-envision the world in the light of hope. Download PDF. E-book versions: click here for .mobi (Kindle) or click here for .epub (other readers and apps). 22. Whose Earth? Rio+20 Helen Heather and Sarah Hulme of Tearfund wrote this helpful JRI briefing that lays out the issues discussed by world leaders at the Rio+20 meeting in Brazil in June 2012. The original Rio Earth Summit in 1992 was one of the first times that national leaders (108 from around the world) met to discuss the environment. The briefing sets out paths, such as the concept of Planetary Boundaries, that could link the apparently diverse aspects of “sustainable development” and put us on track to meet the goals of Rio. 21. Apocalypse Now : The Book of Revelation and the Environmental Crisis by Revd Dr Simon Woodman. The imagery of final judgment in Revelation offer its audience an “assurance that, however powerful the forces currently opposing their faithful witness, these satanic systems will ultimately be called to account for their opposition to God’s in-breaking kingdom”. This briefing is adapted from Simon Woodman, “Can the Book of Revelation Be a Gospel for the Environment?” In: Bible and Justice: Ancient Texts, Modern Challenges, edited by Matthew Coomber. London: Equinox, 2011. The author is minister of Bloomsbury Central Baptist Church, and previously lectured at South Wales Baptist College. 14. Global Warming, Climate Change, and Sustainability : a Challenge to Scientists, Policy-makers, and Christians (2011) 4th edition, by Sir John Houghton. This 12 page briefing is a concise and extensive survey. It looks at the concept of sustainability, the science of climate change, and the current state of policy. Impacts on sea level and regional freshwater availability, and the incidence of extreme events such as floods and droughts, are all explored in detail. The author was co-chairman of Scientific Assessment for the IPCC (1988-2002), Chief Executive of the Meteorological Office (1983-1991), and Professor of Atmospheric Physics at the University of Oxford. 20. The Coalition Government : Does Blue and Yellow make Green? Richard Weaver and Helen Barclay of Tearfund produced an analysis of the first year of the Coalition Government in the UK (Conservative and Liberal Democrat), focusing on their policy on Climate Change. David Cameron’s aspiration to lead the greenest government ever is compared to the manifesto and choices made so far. Progress from George Osborne on the Green Investment Bank, and Chris Huhne’s clear leadership at the UN climate talks in Cancun are mentioned. 19. Copenhagen and the Climate Change Crisis by Sir John Houghton. Following the JRI pre-Copenhagen workshop in 2011, and subsequently the Copenhagen Climate Change conference with its disappointing result, here is a detailed analysis by the JRI President of where we stand. It discusses positive features of the Copenhagen Accord, and the contribution of the European Union. The lack of public acceptance of science is identified as a key problem and explored in depth. 18. Joseph, Pharaoh, and a Climate Crisis by Sir John Houghton. This briefing links the biblical story of Joseph in Egypt and the urgent challenge of climate change. The warnings have been given and the time of opportunity is now. 17. British and American Attitudes to Nature by Revd Keith Innes. Explores how concepts of “nature” are associated with particular landscapes, and the differences between British and American perceptions. Themes of conquest and conservation are discussed. It is suggested that alternative spiritualities should “provoke us to ask whether Christian churches offer a biblically-based spirituality that connects with the concerns of campaigners for the earth”. Revd Keith Innes did his M.Phil. thesis on Wilderness in the Old Testament. 16. Co-Redeemers : a theological basis for creation-care by Revd Dr John Weaver. This is an edited version of a paper given to the Baptist World Alliance Theological Educators Conference in Prague, 26-29 July 2008. The author was Senior Lecturer in Geology at the University of Derby before training for the Baptist ministry, and later becoming Principal of South Wales Baptist College. 15. Big Science, Big God by Sir John Houghton. Subtitled “Science and Faith in a strong embrace” this 16 page briefing (12 pages in the print edition) shows that God’s revelation in the two “books” of His works and the Scriptures are not in opposition. The original version of this paper was prepared to accompany talks given at Wheaton College, Chicago, and Tulane University, New Orleans, in January 2007. 13. Environmental Christianity : insights from our Jewish heritage by Revd Margot Hodson. Jesus affirmed the authority of the Hebrew Scriptures and there is a strong Jewish influence in the New Testament. As western Christianity developed it absorbed other influences, particularly from classical Greek thought. Reclaiming some of the Jewish understanding of Jesus’ first disciples throws new light on how we can address contemporary environmental issues. Revd Hodson has also written on the Old Testament book of Isaiah, in the Grove series: Uncovering Isaiah’s Environmental Ethics. 9. Biblical basis of Caring for Creation by Professor Sam Berry. Sets out a Biblical basis for creation care around the following propositions: God works in the world; God is separate from creation; Christ has redeemed all things; Our response is stewardship. Failure to look after the environment is disobedience to divine command, and a sin. This differs from the view common among Protestants that the Earth is merely a stage for God’s saving work. The author is Emeritus Professor of Genetics at University College London. 3. Creation’s Destiny in Jesus Christ by John McKeown. This briefing was a response to negative language about the earth, and suggests that an earth-affirming theology is compatible with literal and futurist interpretations of texts associated with eschatology. The first edition was written in 1998. 8. Towards sustainable consumption – visionary or illusory? by Dr Peter Moore based on material provided by Professor Brian Heap. Human consumption of scarce resources in the world is rising rapidly. Urgent thought is being given to whether the availability of these resources to future generations is being threatened. Can we move towards more sustainable consumption? This briefing addresses some of the issues involved. 7. True ‘Creation Spirituality’ : A critique of ‘Original Blessing’ by Dr Andrew Basden. This briefing engages with the ideas of Matthew Fox about Original Blessing and Original Sin. John Ray, father of natural historians by Professor Sam Berry. In the 17th century John Ray blazed the way for a truly modern view of the natural world and set forward a theological coherence which we are only just beginning to appreciate. Clarence Glacken complements the description of John Ray as the Father of Natural Historians by describing Ray’s book The Wisdom of God manifested in the Works of Creation as “probably the best natural theology ever written.” (1967:379) All downloadable items are available as PDF files. All except starred items are also available as printed papers from the JRI office. The list above does not include earlier JRI briefings which are listed on a separate page as Archived Briefings. JRI welcomes submissions of new papers for consideration by the editorial committee for the Briefings series. Please contact the JRI Administrator.